3 film, 4 disc collection of early 1970s Spaghetti Westerns with three of the genre's favourite stars. Koch Media R2 German boxset. Born in the early 1960s, the genre really hit its peak in 1965 with famous entries from Sergio Leone and Sergio Corbucci. By the 1970s however, it was starting to fade out with endless slapstick and self-parody films. Fortunately, among the mix there were still some good titles, and the genre hung on for another seven years before being put to rest. The origins of the Halleluja title, present on all three films in this set, are rather mixed: throughout the Euro-cult era, from Pepla to Gialli, film titles were not just translated in different countries, but often completely changed - thus a film like Pochi dollari per Django (1966) [Some Dollars for Django], became Django kennt kein Erbarmen [Django Knows no Pity] in Germany, and Alambradas de Violencia [Wire Fences of Violence] in Spain. Many German titles came to incorporate the word Halleluja to mean simply a 'hurrah' - including La Più Grande Rapina del West (1967), known in Germany as Ein Hallelujah für Django, and the word stuck. Thus for two of the films in this collection, the word is simply a part of the title - Ein Halleluja für Camposanto [A Hurrah for Composanto] and Sando Kid spricht das letzte Halleluja [Sando Kid saves the last Hurrah]. 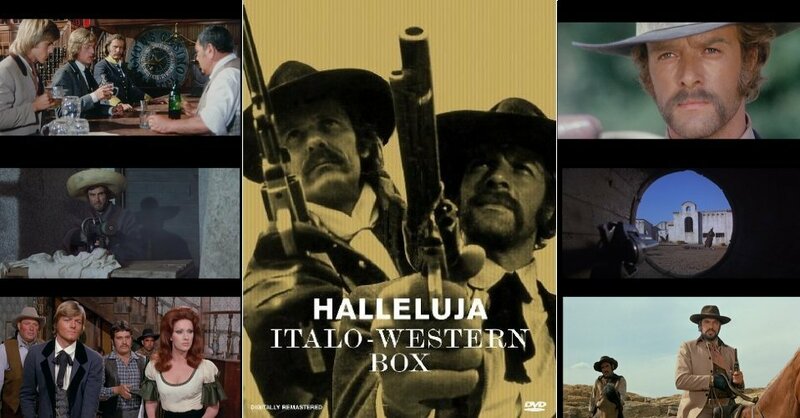 However, to complicate matters, producer Dario Sabatelo shot two films in which the main character was actually named Hallelujah - They Call Me Hallelujah, included here, and Return of Halleluja (1972) both starring George Hilton, and there was a low budget exploitation production entitled Alleluja & Sartana Are Sons... Sons of God (1972) shot around the same time. Anyone famous in it? The Euro-cult stars Gianni Garko, George Hilton, Peter Lee Lawrence and William Berger play the lead roles, and there are plenty of familiar genre faces. Spaghetti Western fans should certainly enjoy this collection, but genre newcomers will probably find a lot better and more well known films to watch first. Subtitles All the discs include German and English subtitles for the Italian tracks. All of the discs include original theatrical trailers and poster/stills galleries. The They Call him Cemetery disc includes a 25 minute documentary about director Anthony Ascott including interviews with the director, and actors George Hilton and Gianni Garko. With English and German subtitles. They Call Me Hallelujah includes an 8mm version of the film, in German only, running to about 30 minutes. The boxset includes an Audio CD containing the soundtracks to They Call Me Halleluja (1971), and the sequel Return of Halleluja (1973) - very good quality, stereo recording. The boxset also includes a detailed booklet about religion in the Spaghetti West, all in German. Packing A fold-out digipack contained in a slipcase. Other regions? Some films have releases in other countries. None superior. Cuts? All films are believed to be fully uncut. Prints are a mix of German and Italian. Three solid films, ranging from quite serious American style (Raise Your Hands Dead Man) to pure comedy (They Call me Halleluja), all recommended to genre fans. A strong set of prints with good audio and subtitles. The interview feature is very interesting and the soundtrack CD is a good addition. The only slight downside, for some, is the absence of English dub tracks. All text in this review written by Timothy Young - July 2007.